You are here: Home / Will Cell Phones Replace Landline Telephones? Will Cell Phones Replace Landline Telephones? What if everyone in the world woke up one morning and all land-line telephones had disappeared? What would happen to global communications if we only had cell phones to make calls? But Papoulias’ statement is unclear. First, 15% of all mobile phone users is not the same as 15% of all phone users. Second, he cites one survey, then jumps to another study, of under 30-year-olds, saying “Well, it’s quite clear…” Is it 15% of all phone users or 15% of those under 30 with cell phones? Regarding the 100% cell phone penetration, do 13-39 year-olds have more than one mobile phone, 40+ year-olds have a cell phone and a land-line? And 41-65 year-olds only have land-line telephones? He doesn’t say. In a 2009 FCC Report, 58% of U.S households had both land-line telephones and wireless services, 25% wireless only and 15% wireline only. But the vast majority of the 25% wireless only household residents were 30 and under. While it’s clear that more Americans are “cutting the cord,” 122M American households had land-line telephones at the end of 2008. As traditional services decline, VoIP, including Skype and Google Voice, is expanding in both the U.S., Australia and elsewhere in the world. In Australia, VoIP connections are increasing by 3% per month. VoIP subscribers share many of the same benefits of traditional land-line service at greatly reduced costs for local, domestic and international calling. True, phones are connected to the Internet. So if your Internet connection fails, your call drops. But cable and fiber-optic Internet connections offer up-time of 95%+, similar to traditional land-line service. If all U.S. landlines (122 million) were ported to cellular, the carrier’s networks would collapse due to insufficient wireless spectrum. 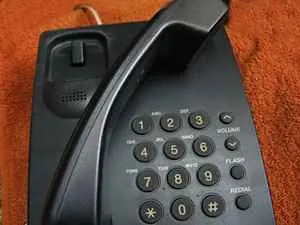 Until some bright person invents a new way to compress voice and data bandwidth on assigned cellular frequencies, it’s impossible to port all landlines. So will cell phones replace land-line telephones in the U.S.? Unlikely and not very soon.